So please remember to hop over to Sketchabilities and check out the sketch & all the amazing layouts by the DTs. Do come back to check out Team D's reveal on the Jan 31st. Have an awesome weekend everyone!! Wow, so so so soft and wonderful, really great layout, and love the layering and of course the misting!!! I agree! Karan has the best sketches! Her layering is definitely my style and I love your take! All the little touches to make it your own.. lovely colors and that lace... so pretty! Ohhh Jessy I love this layout. 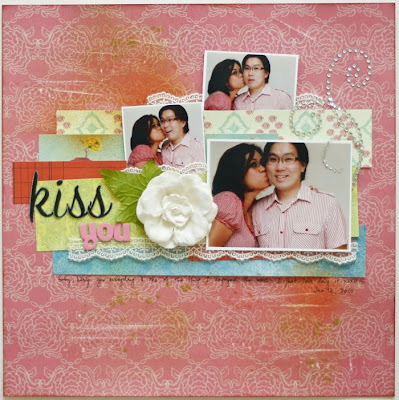 The layering look is awesome and I love that prima bling - I will have to get myself some of those! awh Jessy...that is so nice of you to say that, i like my sketches too..your take on it is gorgeous...love everything about it! Love this one, Jessy!! And the photos are just too cute!! i love this layout!!! you did such a fabulous job!! look at you lovebirds!! love your take on that awesome sketch Jessy. That is just sweet Jessy! Totally agree on Karan's sketches! Oh and have I told you your photos are great! Beautiful colours I do agree!